Losing Pip, I first thought, would not be part of the deal. 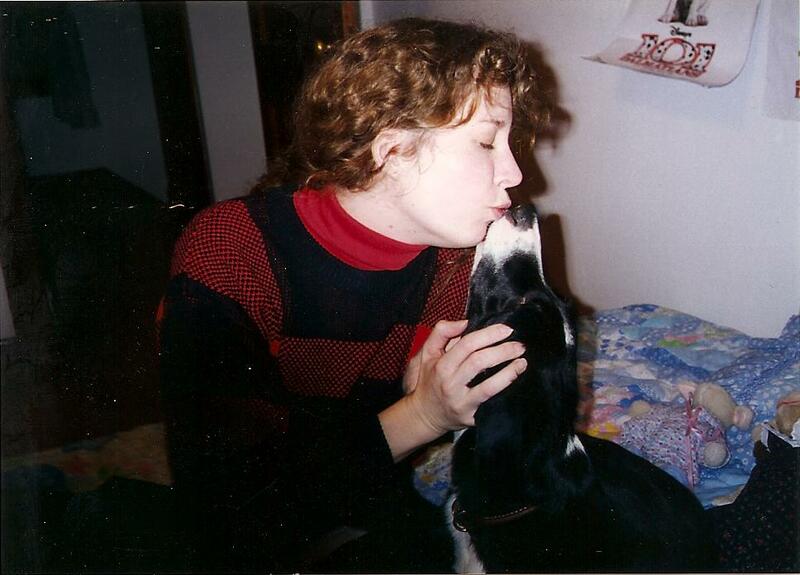 When Delaney was eight and I left Joe, I was stringing together part-time jobs writing, editing, and teaching at poverty-level wages and could take only one dog with me. Forced to choose between them, I took Casey Jane, Delaney’s dog, because Delaney was coming with me. For six months I begged Joe to keep Pip so Delaney would not lose Pip, too, and would still have a dog at her father’s house, but also I was hoping that within a year I could improve my situation enough to keep two dogs again. Joe refused to keep him. Pip, left alone most of every day, got depressed. The few times I entered that house again, he slipped himself into my lap, froze there for a short spell, sniffed my ears, and let me bury my face in his coat, and then before I even roused myself to leave, he dropped to the floor and curled up behind a chair with a throaty sigh. In those painful, hectic days, whenever I allowed myself to think about Pip, I was stunned and ashamed to have put myself in a situation in which I could not take care of my friend. I think you did what you could at the time– both when you called Border Collie Rescue (and I of course came upon these three paragraphs because I read what really happened), and when you wrote these three paragraphs and made the story more palatable, if less true. You can’t always tell all of the truth about everything that is in a book; if you did, you’d lose the tight focus. Could you revise the book and add the whole truth of this situation without losing focus? I believe you could. But whether you want to is another question, one that only you can answer. I also think you’re an incredibly smart, competent, and wonderful woman. It’s a shame that abusive men systematically tear women down. I’m glad to see you going up, up, up where you belong. Focus must challenge all writers, but narrative nonfiction writers to a different degree. The more you bid your memory, the more it yields, and the more detail you may find unfurling on the page. You have to constantly ask yourself what’s this about BEYOND ME? In an effort to be as fair-minded as possible, I had added why my ex was so angry at me. I cut it, not because it made me look bad (as you know, I trot out my shortcomings in “Since My Last Conception”), but because it distracted from the main topic, which was our responsibilities to the animals in our care. Besides, as I wrote, I realized that whether the ex’s anger at me was justified or not, it did not excuse or even explain how he treated Pip. Ultimately, my ex and I had different moral codes. He may see me as romantic, idealistic, frivolous, and himself as a pragmatist always improving his skill at jockeying to win. Poker is his game. He would’ve made a promising politician or a general. There’s no right or wrong, just advantage or disadvantage in the game. People have no intrinsic value to him other than what benefit may be gained by them, and a dog has even less worth. I wasn’t smart enough at the time to confect a financial or social benefit to him. At that point, he could see no pay-off in keeping Pip other than a means to strafe my heart.